Enjoy total control of your house wide audio with this all-in-one music distribution system! The kit can accept up to six independent sources and distribute the music to six distinct locations. 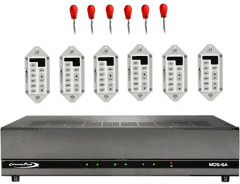 40 watts per channel up to 12 channels. Installation and programming is quick and easy. Using Cat5 cable connecting keypads and amplifier. 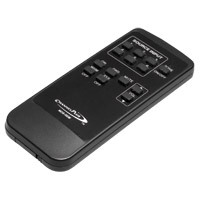 MCS-1A single gang Decora™ keypad with volume, mute, and source selection buttons. The Keypads are back-lit, come with white/almond bezels. The IR targets allow complete control of the connected music source. Include page/doorbell input jack and music-on-hold output jack for optional communications controller. Customized adjusted volume level. Distribute Music Throughout your Home, Listen to different music in each room. This music distribution system from Channel Plus will allow you to listen to your favorite music, while your children listen their own music in another room. Providing the simplest way to please everyone. This system comes setup to support 6 rooms with 2 speakers per room - You can expand this by simply adding another amplifier, with the desired number of keypads. 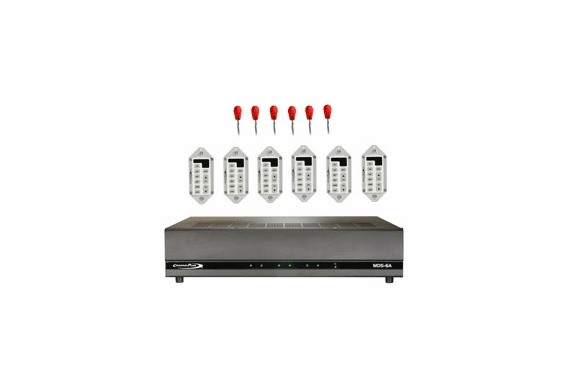 The MDS-6A is an all-in-one music distribution system that can accept up to six different music sources. It offers 480 Watts of total system power (40 Watts per channel, six stereo left & right channel pairs). The six speaker zones can play music from any of the six audio sources. 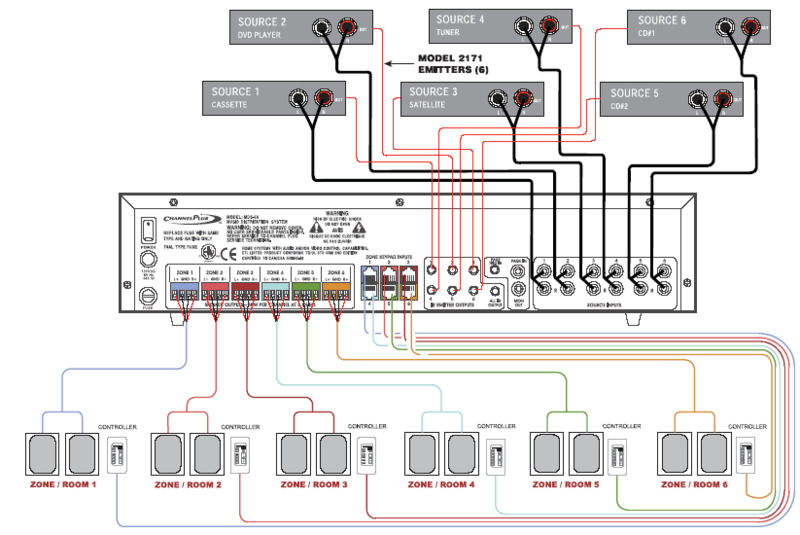 Music Control is provided via either the MCS-1A keypads. 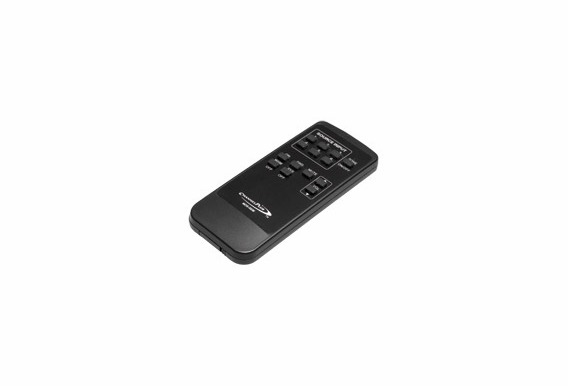 This keypad provides you with flexible control over the MDS-6A and connected music sources and gives the user feedback on the status of the system. The keypads are back-lit and are supplied with white and ivory bezels. The MDS-6A offers the installer a Page/Doorbell input jack as well as a Music-on-hold output jack for interconnection of an optional Communications Controller. 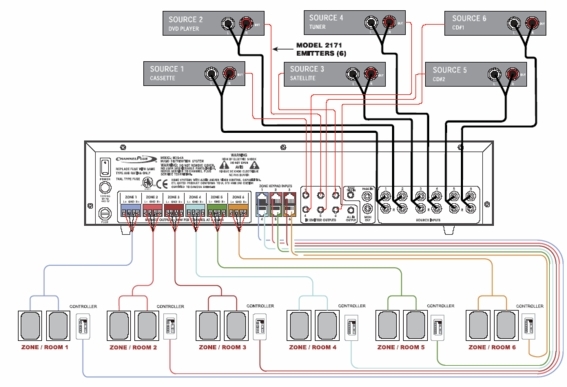 For large installations with up to twelve speaker zones, two MDS-6A amplifiers can be connected to six audio source components using the Model MDS-PCK 6x12 Patch Cord Kit.